Open public data is a key innovation area with the potential to stimulate 2Seas (France, UK, Belgium, the Netherlands) regional economy and promote the delivery of smart public services. Open public data is estimated to have €300B of unlocked value (EU, 2015). Being both data suppliers and users, cities are ideally positioned as launching customers for innovative products and services. The Interreg 2Seas project SCIFI (Smart City Innovations Framework Implementation) aims to activate the market for innovative solutions to improve public service delivery using data. 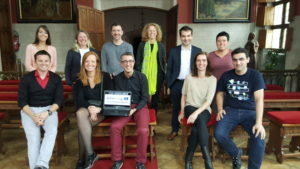 Cities (Saint-Quentin (FR), Bruges and Mechelen (BE), Delft (NL) collaborate on identifying shared challenges in mobility, energy and environment. Supported by business support organisations, like Faubourg Numérique (FR), Agoria (BE), Cambridge Cleantech (UK) and an university (Southampton -UK) they jointly explore innovative procurement methods to work with businesses in developing data-based solutions, implementing them in living labs, and demonstrating the value of opening data. SCIFI launches an Accelerator for Cities and Businesses (with open calls) to co-create practical, sustainable solutions for city challenges. The Accelerator programme coaches both businesses and clients (cities) on: selecting and opening relevant datasets, adapting to EU data standards and formats, addressing issues of IPR and software-specific businessmodels, and engaging public sector stakeholders including citizens and policymakers. So stay tuned! The SCIFI framework will establish the 4-helix relationships and the methodologies for 2 Seas cities to source innovative solutions to urban challenges under a Smart, data-driven approach. This framework will increase the competitiveness of the 2 Seas region in the field of urban innovation, stimulate the innovative sectors of the regional economy and increase quality of life in 2 Seas cities. You will find all available information regarding the project here. Interreg 2 Seas 2014-2020 is a European Territorial Cooperation Programme covering England, France, the Netherlands and Belgium (Flanders). The Programme is part-financed by the European Regional Development Fund and has a total of €241m ERDF to co-finance projects in the 2014 – 2020 period. The overall objective of this programme is to develop an innovative, knowledge and research based, sustainable and inclusive 2 Seas area, where natural resources are protected and the green economy is promoted.